However, redoing your kitchen cabinets doesn’t have to be that hard. All you need is a little help to get their creative juices flowing. 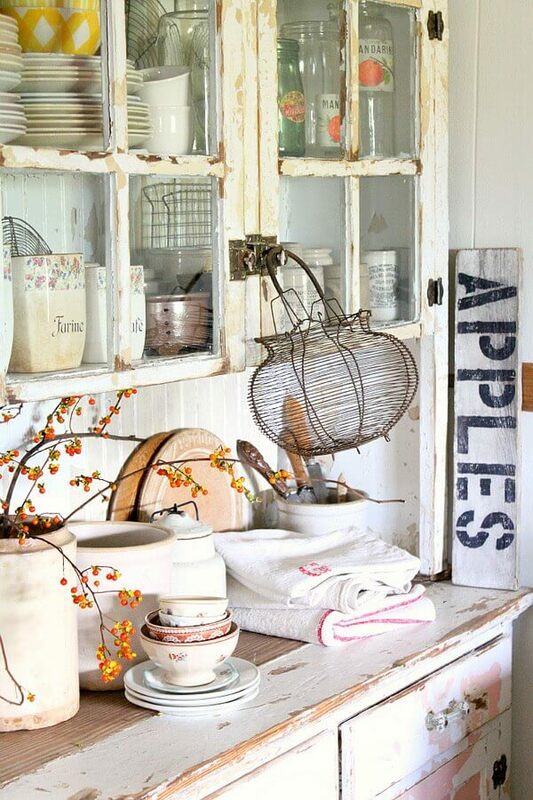 That is why we’ve decided to give you a little inspiration to help give your home those French Country vibes. While we can’t help you create the actual cabinets, we can inspire you to complete your home renovation. 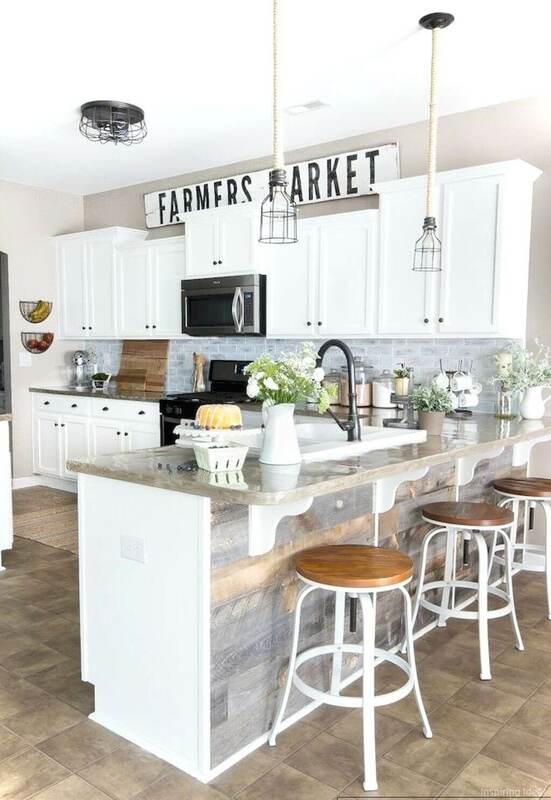 Below, you will find 35 awesome Farmhouse kitchen cabinets that will help transform your kitchen into the perfect rustic farmhouse kitchen you’ve been craving for so long. 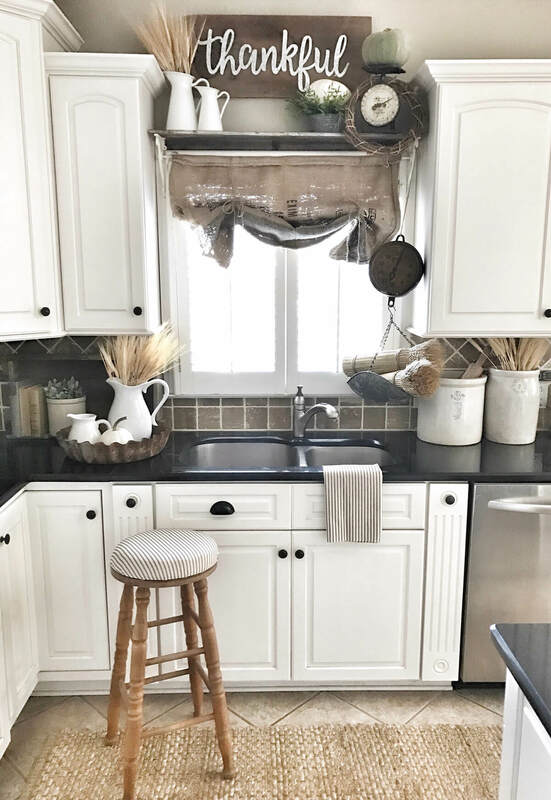 If you’re looking to add some cozy farmhouse style to your small kitchen, this might be the perfect design for you. The clean white cabinets and classic white sink make the space feel large, but the butcher’s block countertops and burnished silver drawer pulls give the whole look a rustic flair. This look combines modern and industrial styles. 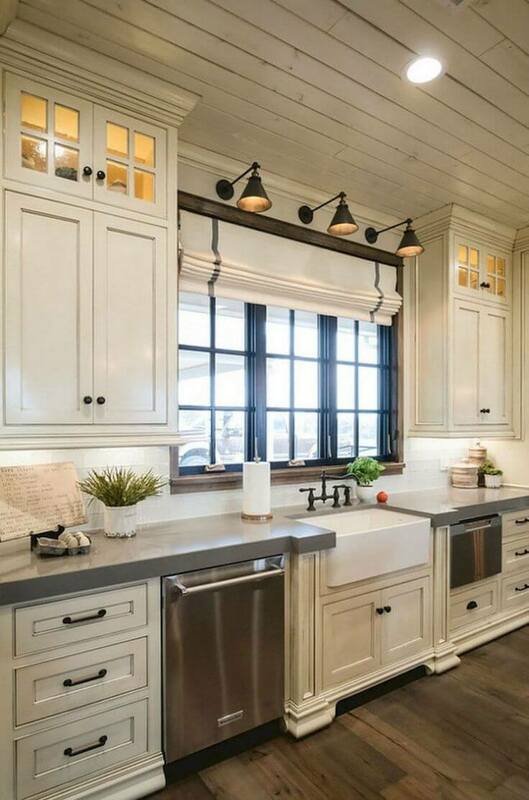 The greyscale cabinets with their clean straight lines give the look a modern flair, but the liberal use of shiplap and the industrial lighting balance things out and give the space an industrial farmhouse feel. Open shelving and stainless steel appliances finish things off and the ceiling-high grey tile backsplash adds another dimension. 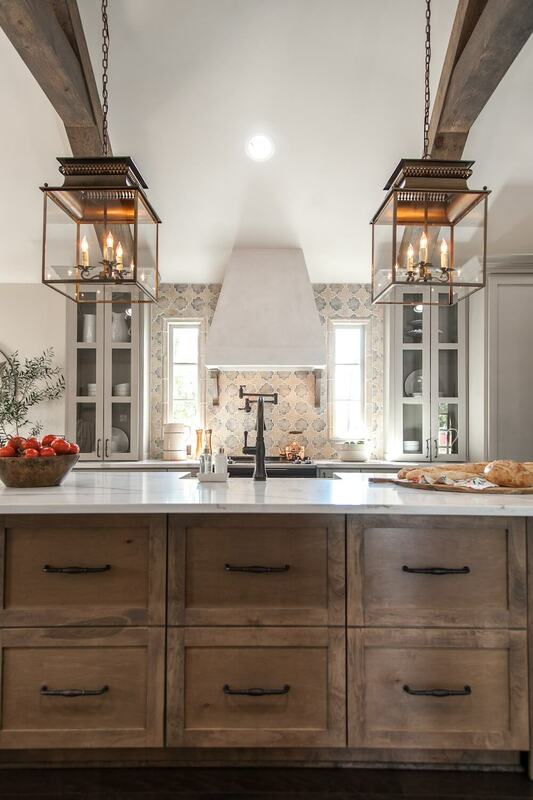 Beautiful finished wood cabinets and an oversized porcelain sink are the highlights of this Victorian-style kitchen. 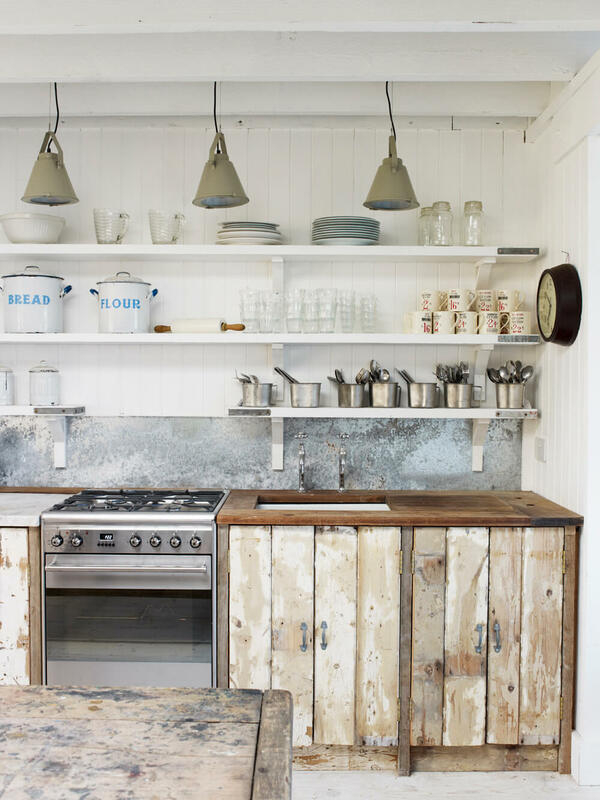 The use of a bright blue section of cabinets and the slightly raised countertop underneath the farmhouse-style dish rack adds interest and gives the style some depth. White stone countertops give the space a fresh, clean look and keep the 4. Victorian accents from stealing the show. 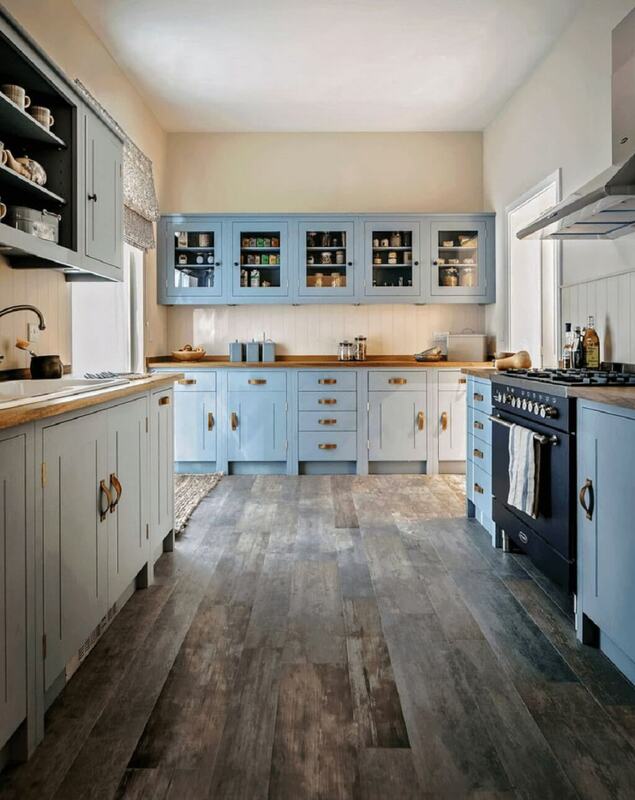 If you’re looking for kitchen ideas that will seamlessly blend clean modern details with a classic farmhouse feel, you will appreciate the balance of this look. 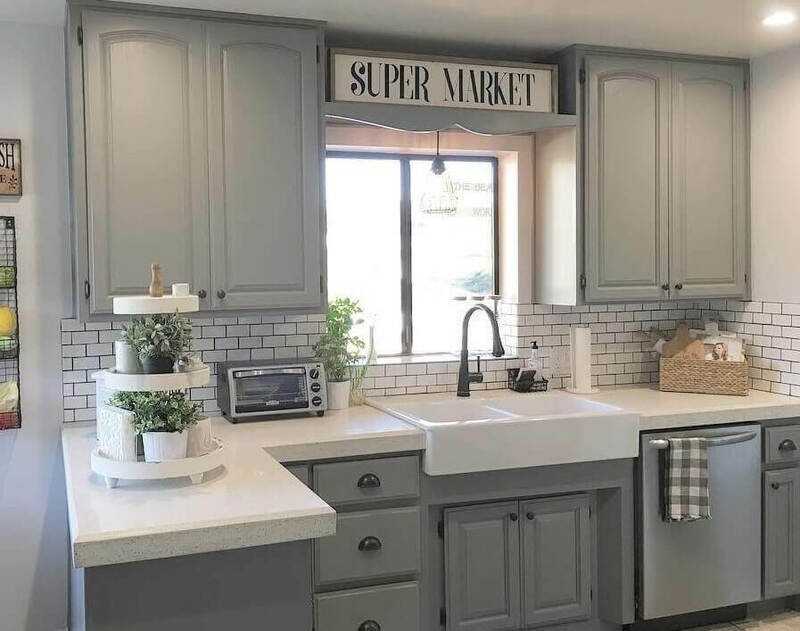 The cabinets are made with a traditional farmhouse structure in mind, but their painted grey cabinets, white stone countertops, and subway tile backsplash keep the look fresh. 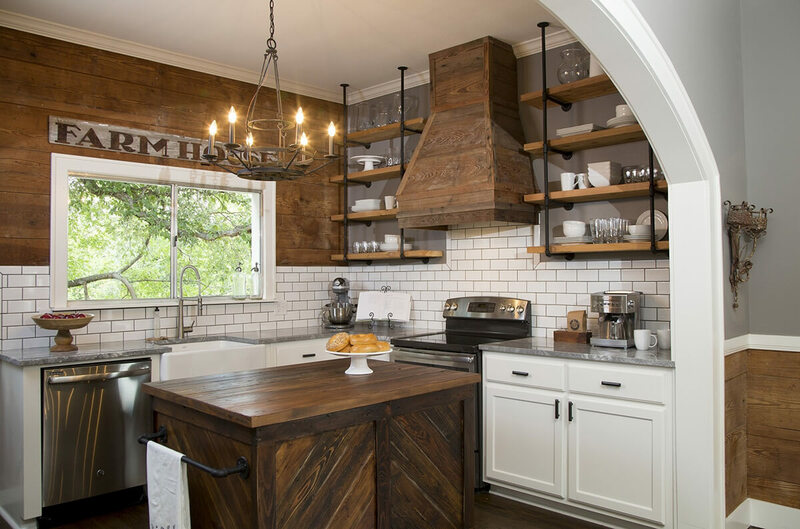 Another example of a farmhouse style with a modern twist, this kitchen is both beautiful and functional. White cabinets make the space feel large and airy. Black countertops and accents pop, making the whole kitchen feel a little more modern. Another great thing about those dark stone countertops is their ability to disguise any stains or discolorations. Cabinets with a handmade look, khaki paint job, and vintage heavy metal accents make this kitchen feel cozy and aged. A vintage porcelain sink adds its own element of age and creates a focal point. These elements, coupled with a beautifully polished butcher’s block countertops create a warm and inviting kitchen that your family will love. With the perfect blend of white cabinets and wooden focal points, these cabinets create a balanced modern Tuscan vibe. 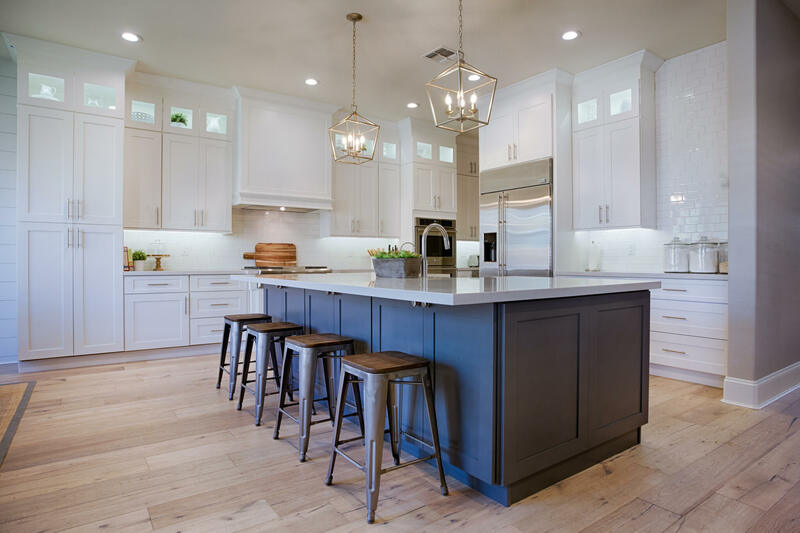 Clean lines and fresh white paint with sleek, simple drawer and cabinet pulls on the lower cabinets play off of the dark wooden island cabinets. Open upper cabinets with industrial accents create a mid-point between the two and tie their very different styles together. Another example of a blended modern farmhouse look, these fresh white kitchen cabinets create the illusion of an enormous space. Light stone countertops with high polish and light grey backsplash further this illusion. Darker drawer pulls, floor tiles, and grey-tinted shiplap on the outer face of the breakfast bar give the space some depth and add enough interest to keep the space from feeling washed out. If you’re looking for something with an authentic vintage look, these cabinets may be your speed. Roughly hewn cabinets with unfinished faces and incomplete paint jobs serve to create a style that is authentic and interesting. 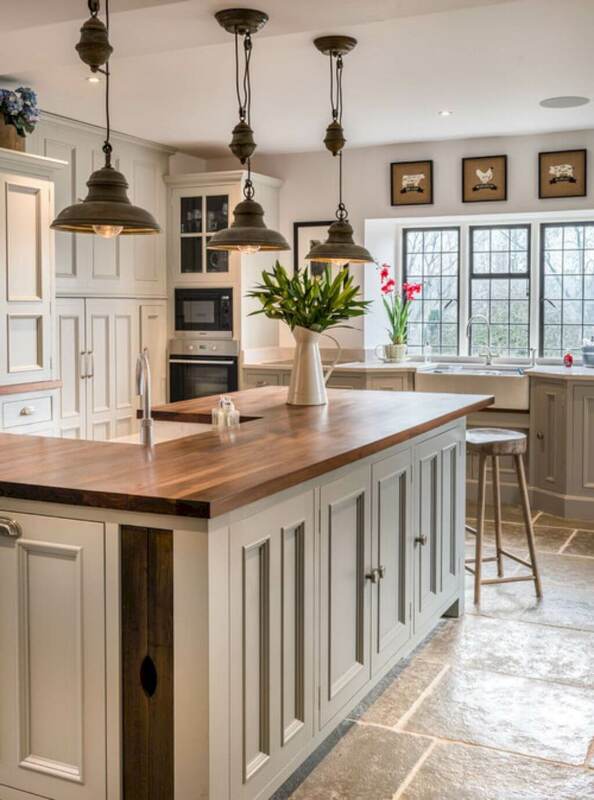 Dark metal accents and mismatched paint jobs add add to the style while the consistent use of unfinished butcher’s block countertops keeps everything cohesive. Playing off of the traditional French country look, these farmhouse cabinets feature clean straight lines and copper accents. 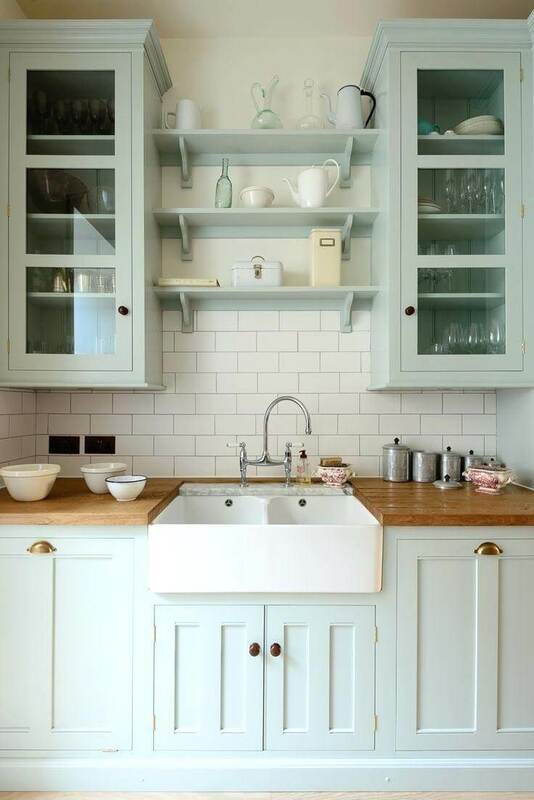 Their mint-colored paint job and the use of glass faced upper cabinets is refreshing and delightfully charming. 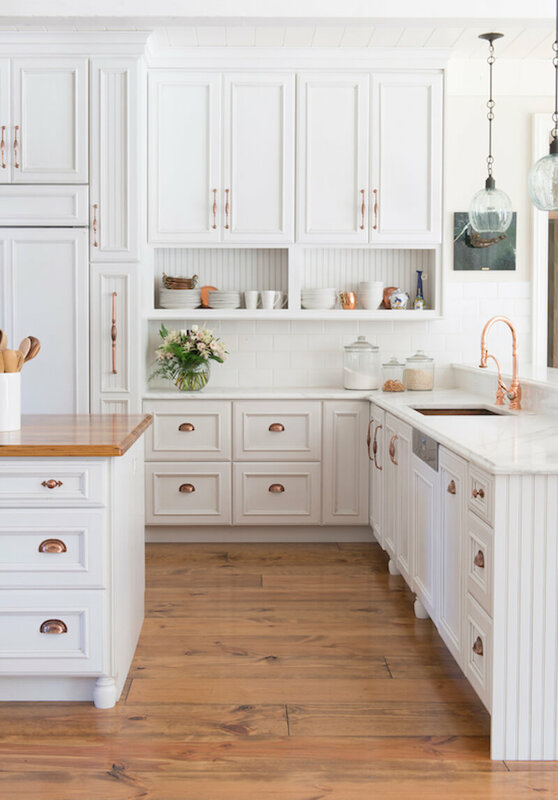 The wooden countertop plays nicely with the copper accessories and brings the look back to its farmhouse roots. 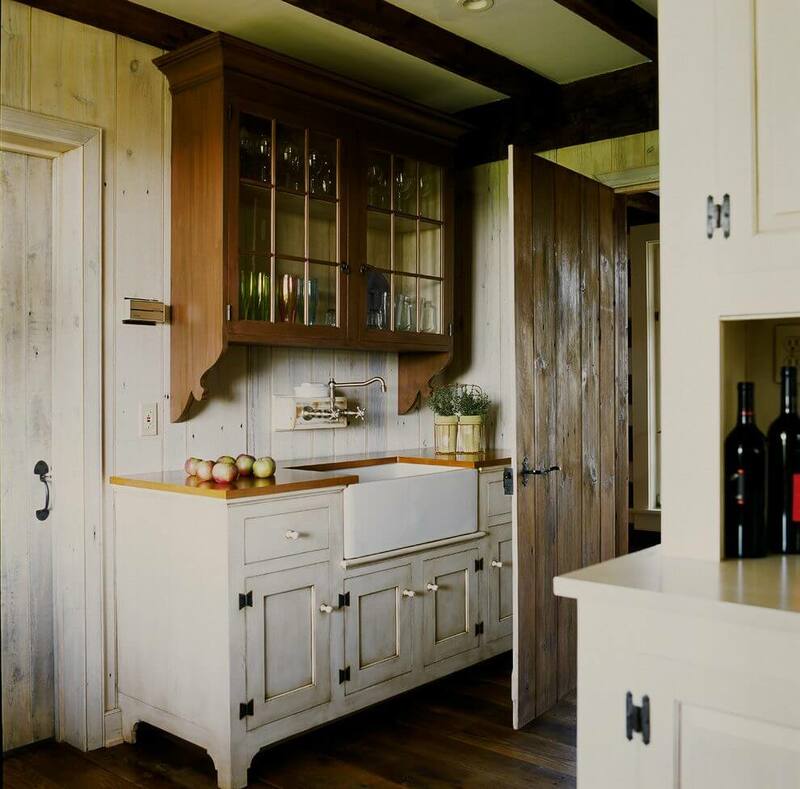 Beadboard cabinets are beautiful and versatile. 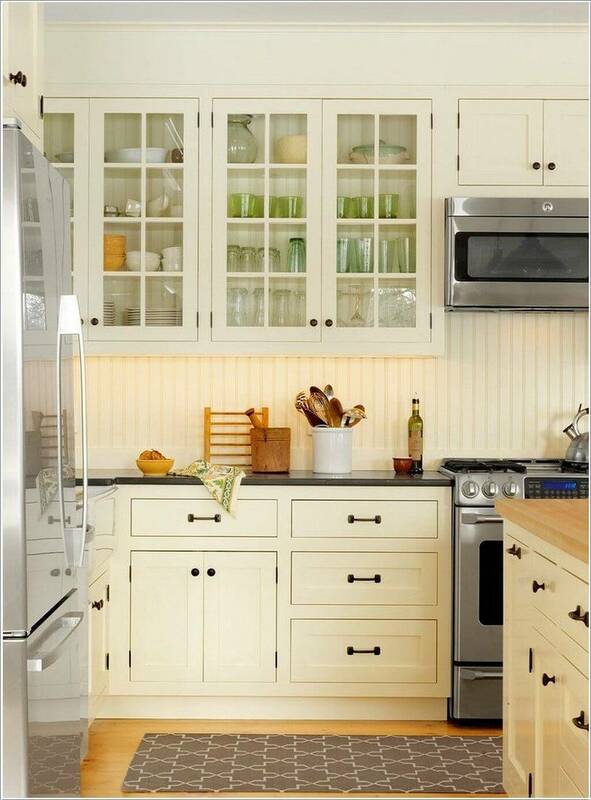 Although they are traditionally linked to cottages, these cabinets instantly add to the charm and style of the kitchen. The addition of an open faced shelf for the storage of cookbooks and glass-faced dish storage gives the space a distinctly farmhouse flair. The use of highly unfinished kitchen cabinets may be controversial, but we think that it has the potential to be highly fashionable. Carrying the unfinished look from the cabinetry to the countertops prevents any clashing of styles. 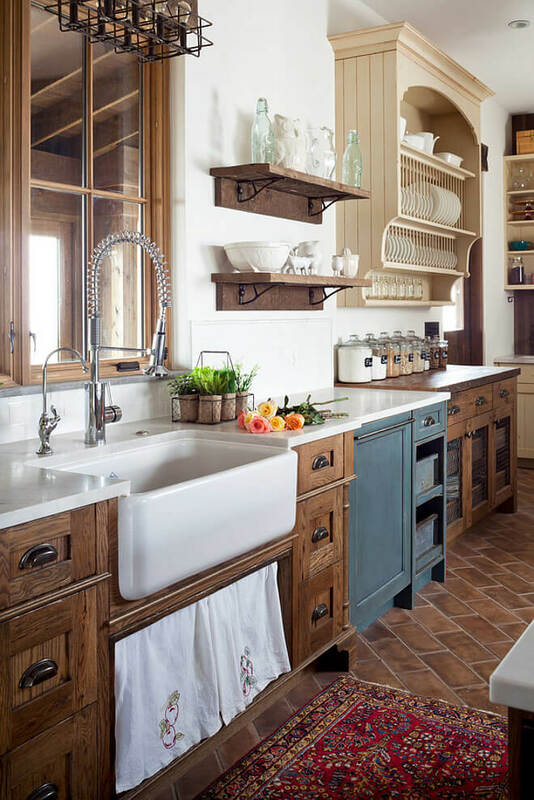 Adding a glass face to the upper cabinets provides a safe space for the storage of china or dishes and adds to the look’s farmhouse style and keeps the unfinished wood from overpowering the rest of the room. Modern kitchen cabinets coupled with open faced upper cabinets and beadboard backsplash make this kitchen look open, airy, and clean. Glass-faced cabinets upper cabinets are strategically placed to display glassware and closed lower cabinets offer a storage for unsightly kitchen gadgets. It’s not often that we see brightly polished accents on white cabinets, but this kitchen proves that the look can be stunning. Clean white lower cabinets are coupled with open faced upper cabinets. Bright gold accents on the lower set stand out beautifully, but the lack of accents on the upper cabinets keeps the sheen from being too distracting. Blue cabinets with wooden accents and a beadboard backsplash creates a look that’s reminiscent of a beachside cottage. The fresh paint job is interesting and cool, but the wooden countertops and accents adds warmth. Open-faced upper cabinets frame glassware or cooking necessities and create a cozy display. 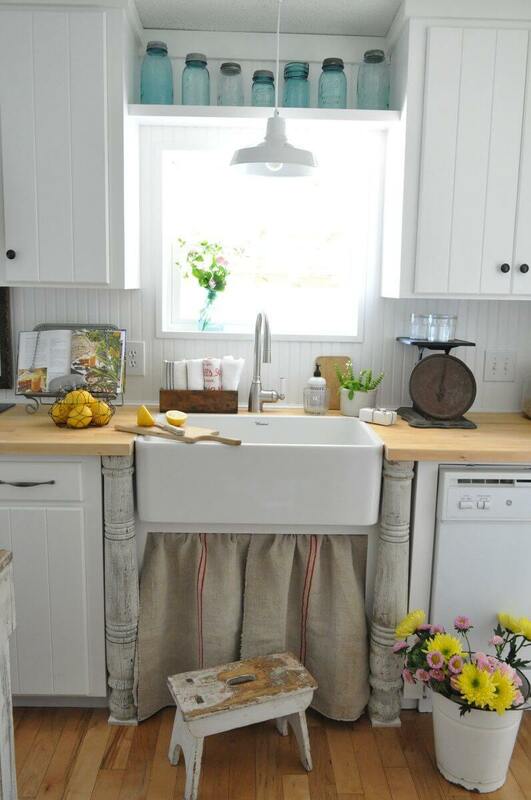 The combination of elements creates a beautiful crossover between beach and farmhouse styles. 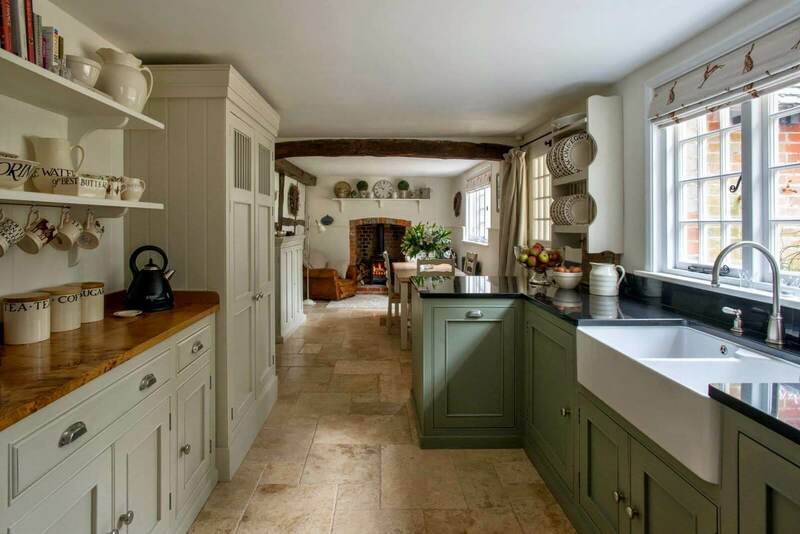 Another excellent color pattern for farmhouse kitchens is olive green and off-white. Olive green darkens the space and gives it a warm, intimate feel. Off-white maintains those warm tones better than pure white, but it also opens up the space. To keep the cabinets uniform despite their different colors, this kitchen uses a uniform set of bright metal accents. 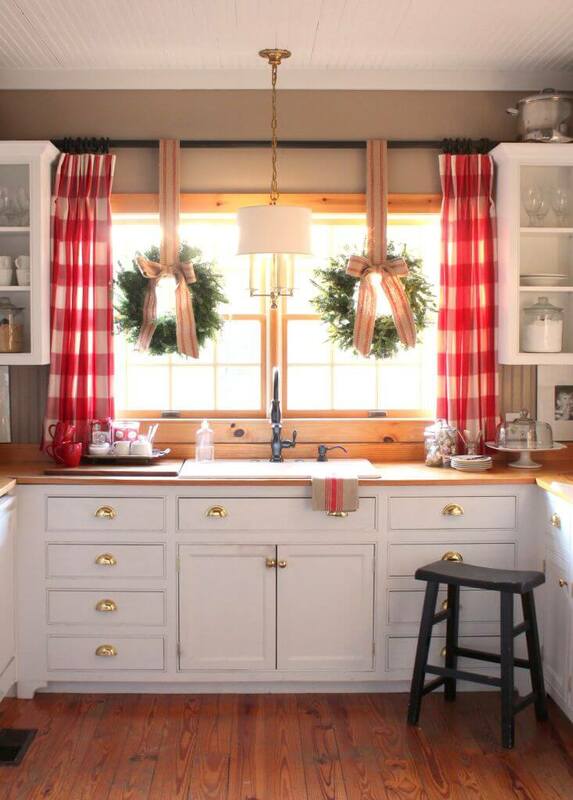 Beautiful farmhouse cabinets frame an oversized, modern kitchen window and roman shade. Light cabinets and a deep porcelain sink work with sleek grey countertops, dark metal accents, and stainless steel appliances to blend traditional and modern elements. Raw wood lower cabinets bring warmth to the kitchen space while bright white upper cabinets fade into backsplash and reflect the light brought in from fixtures or windows. An open shelf on the upper cabinets complete with raw wood beadboard backing and raw wood crown moulding frame these upper cabinets and tie the elements together. 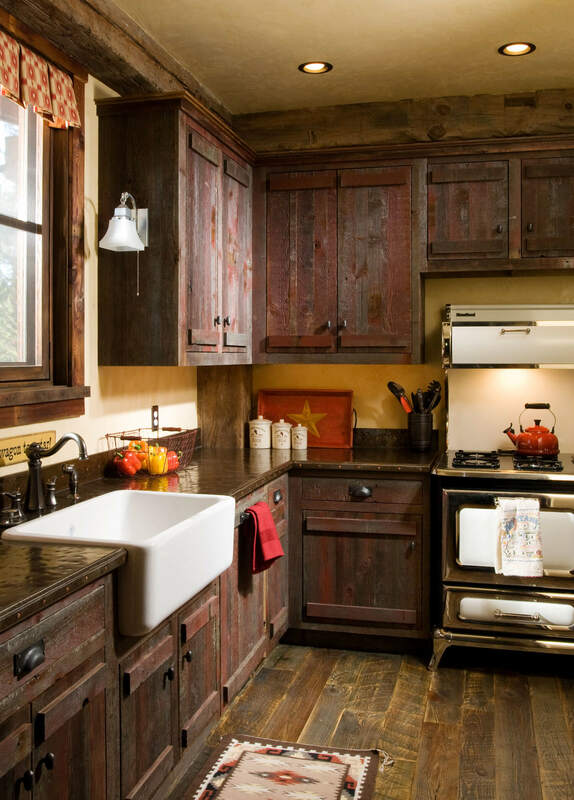 Dark oak cabinets with a handmade look give this kitchen an undeniably intimate atmosphere. Vintage elements, like the stovetop, go perfectly with the dark, dimpled countertops. Pops of bright white color prevent the space from feeling claustrophobic, but the liberal use of rough, unfinished wood and burnished bronze accents keeps the space cozy and warm. These cabinets provide plenty of storage and style. The traditional farmhouse cabinets surround an oversized kitchen island complete with a meal prep area and second sink. Painting the cabinets khaki works to give the space a warm feel without sacrificing the light and airy qualities that light-colored cabinets provide. 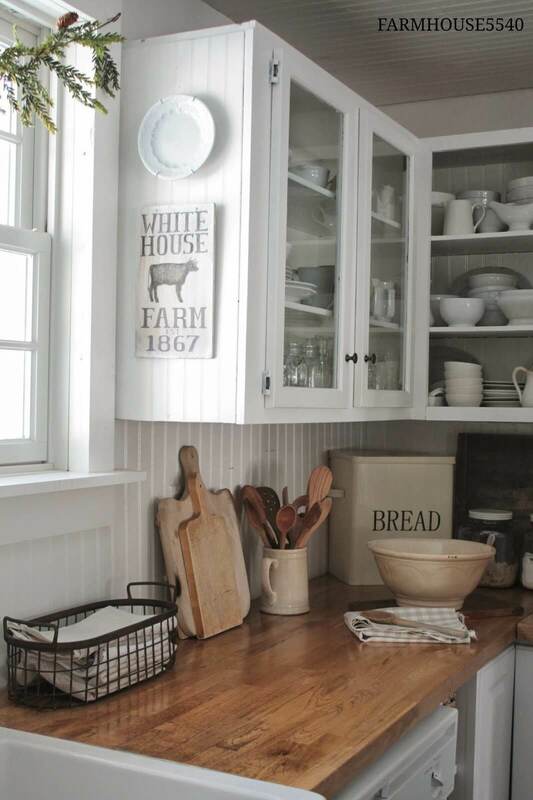 Wooden countertops and farmhouse decor complete this classic look. White cabinets coupled with white walls works to open up a small kitchen. Light colors reflect sunlight from the oversized kitchen window. 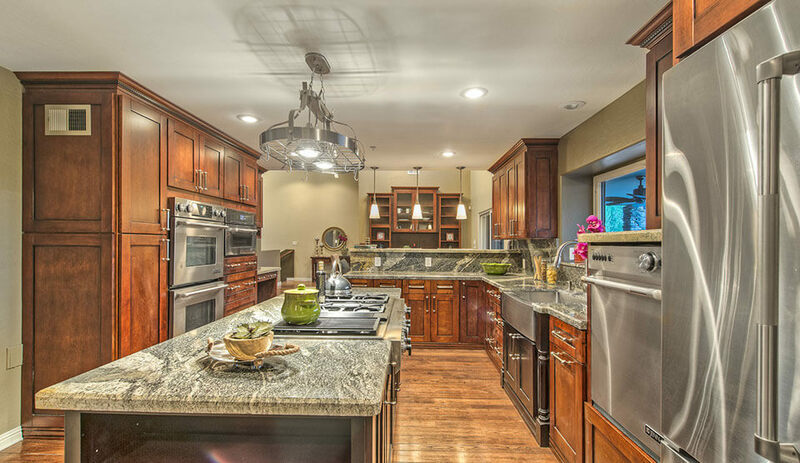 Open faced cabinets create an even more spacious feel. The liberal use of beadboard on the ceiling, backsplash, and cabinet edges adds some charm and personality to the space. These simple white cabinets are full of personality. Instead of using a inlaid beadboard like we’ve seen in some of the other designs, these cabinets use wide panels to create the face of the cabinet. Simple black accents bring some contrast the wide posts framing the porcelain sink add some detail. 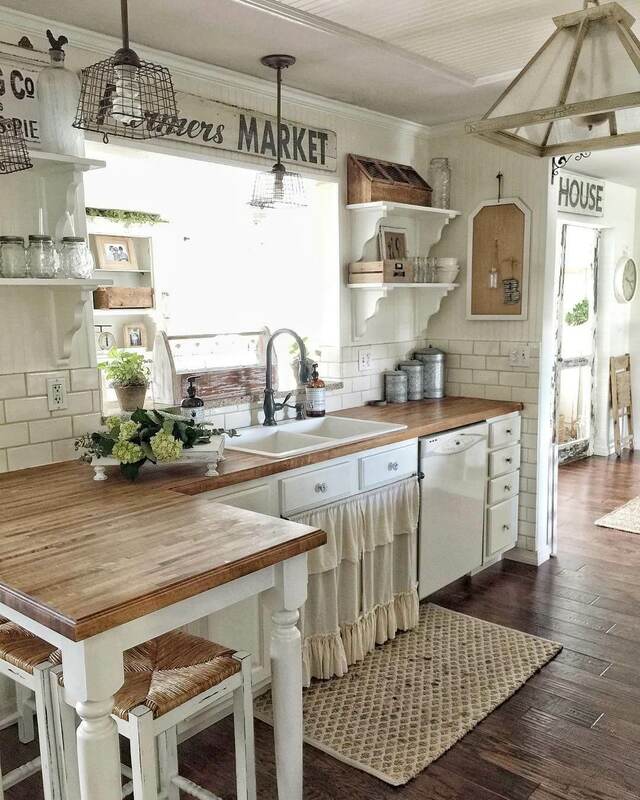 The result is a classic farmhouse kitchen that feels both clean and unique. Refreshing and calming, the light blue cabinets featured in this kitchen are perfect complements for the white accents and dark accents. Adding open corner shelving keeps the space from feeling crowded without sacrificing precious storage space. Under the cabinet lighting is perfect for meal prep looks fantastic! 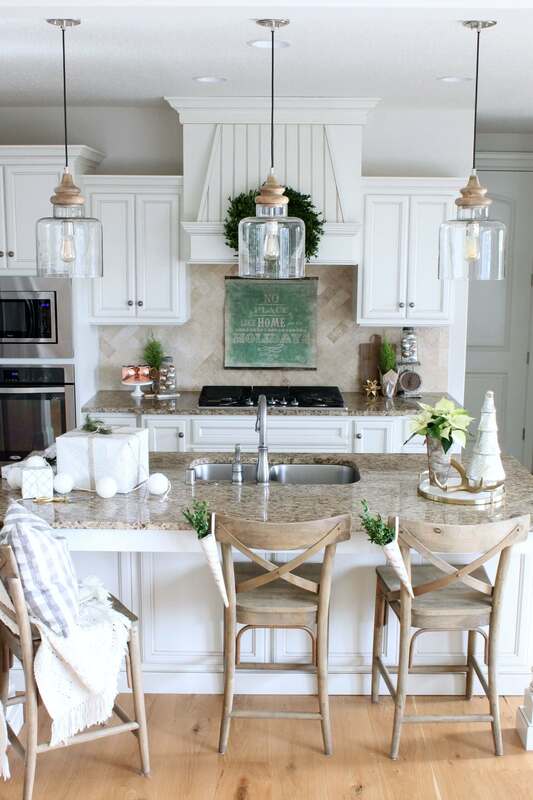 The highlights of this kitchen are the beautiful copper accents. The plentiful cabinet space is traditional, but beadboard accents within the open shelving sections add depth to the design. Lastly, subway tile backsplash and shiny copper accents add a modern twist to a classic design. 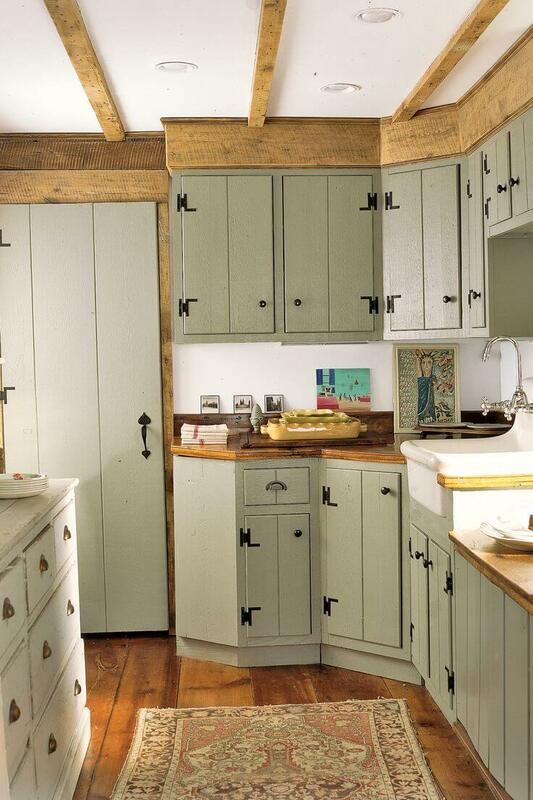 In this design, reused and unfinished shiplap is used to make the roughly hewn bottom cabinets. This rough, unfinished look is carried over to the countertops and the concrete-look backsplash. The bottom half of this design is contrasted by the smooth, open shelving and beadboard wall that graces the top half. 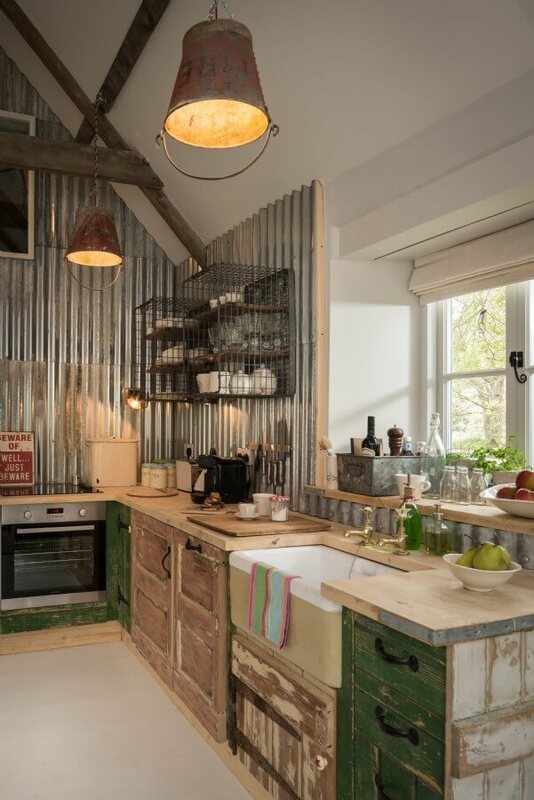 The end result is a farmhouse design that feels genuinely rustic. Unique design choices were made in this kitchen. 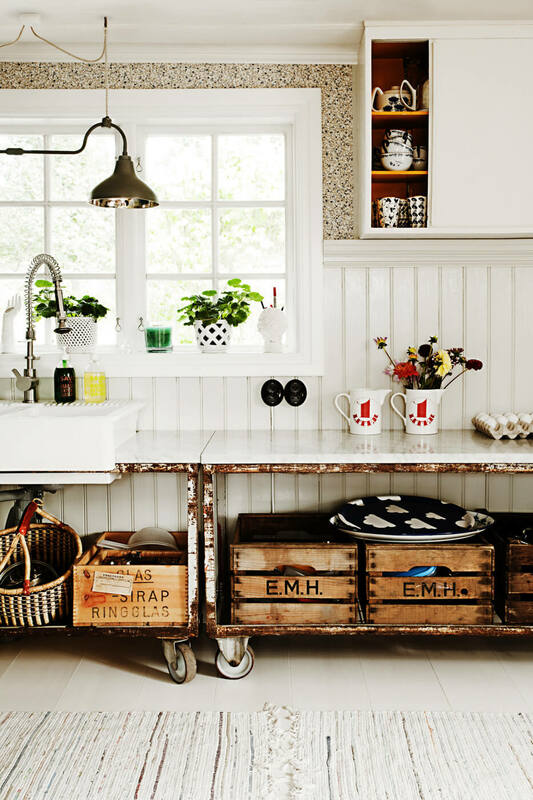 Rather than using classic farmhouse cabinets, industrial rolling carts were filled with repurposed wooden crates for storage. The rusted, vintage look of the lower cabinets are contrasted by the clean white stone countertops and the simple white upper cabinets. Although lots of interesting design choices were made in this kitchen, the use of rolling carts and the exposed piping underneath the sink steal the show. 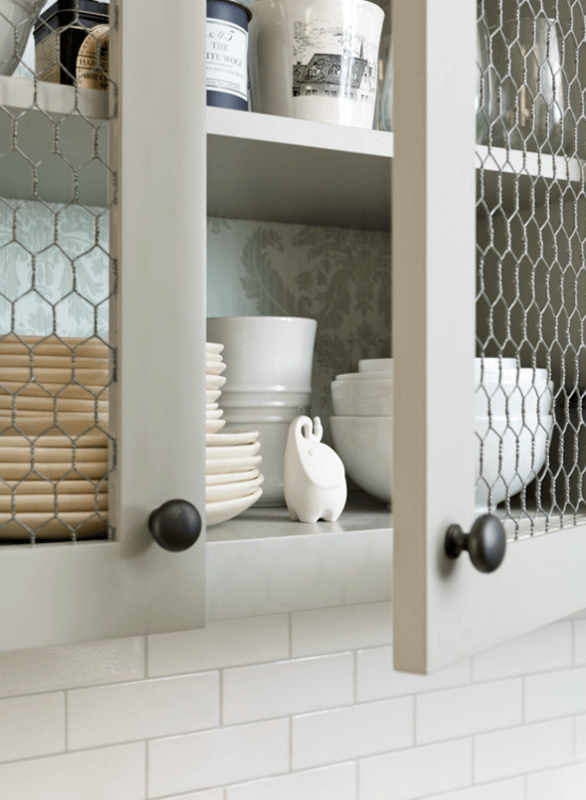 Cabinets with an open or glass face can be found in many farmhouse designs, but these chicken wire cabinets take the design choice to a whole new level. Chicken wire is inherently related to the farmhouse feel, so adding it to the face of your kitchen cabinets seems like a natural next step. Using chicken wire in the place of glass allows you to add some style to your cabinets without sacrificing the safety of your glassware. 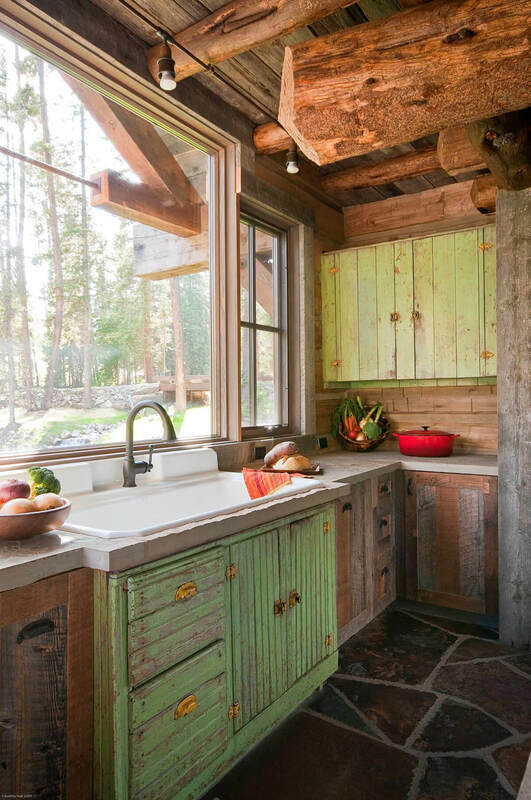 Raw wood cabinets are gorgeous, but these colored cabinets made of rough wood are even more intriguing. Coupled with the rough natural wood cabinets, the colored cabinets really pop. Golden accents on bring some sophistication to the look and a rough stone countertop completes this backwoods cabin look. 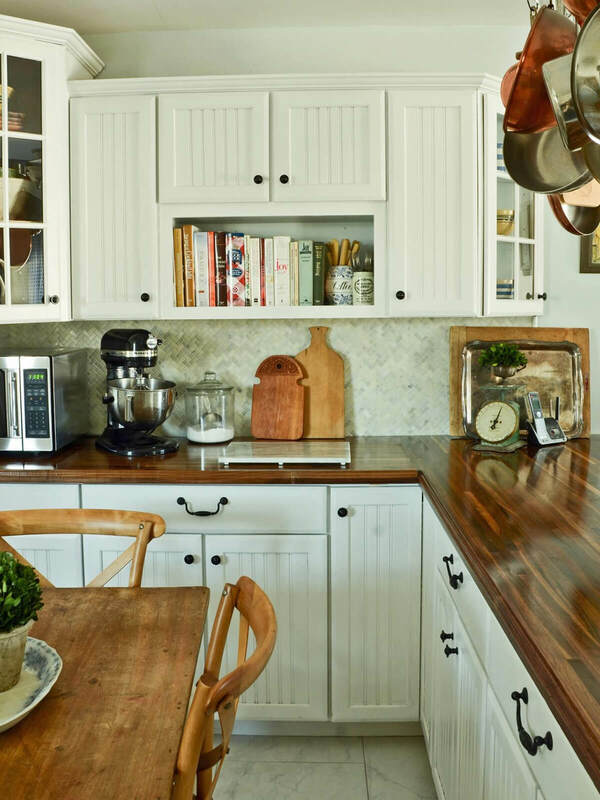 Beveled edges on traditional farmhouse cabinets add a level of sophistication that can be hard to find with this style. White cabinets enhance the space and silver accents work to further the luxurious feel. Combined with the marble countertops, the beveled edges of these cabinets create a high-end look that would be appropriate for any kitchen. 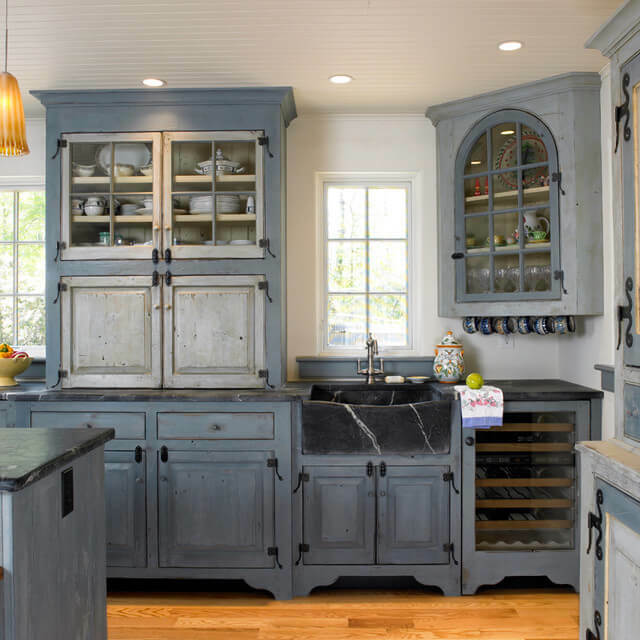 Dark blue cabinets without a glossy finish work beautifully with the black marble countertop and sink to create a high-end cottage look. Light colored paint and a white beadboard ceiling work to keep the room from feeling too dark and the warm wooden floor works to create some warmth in the room that may otherwise have a cold or impersonal feel. Dark upper cabinets work well with the light and distressed design of the lower cabinets. The dark floor makes the lightly-colored cabinets stand out, and the lightly colored beadboard wall does the same for the upper cabinets. The contrast between the two keeps the room from feeling too bright or too dark and adds a very interesting focal point to the room. This kitchen is interesting because it balances the raw wood and dark hardware perfectly with light countertops and modern mosaic backsplash. The sleek and modern open faced upper cabinets play into this balance and give you a place to store and display your china or glassware. Simple and unassuming, this design is functional, classic, and easy to achieve. 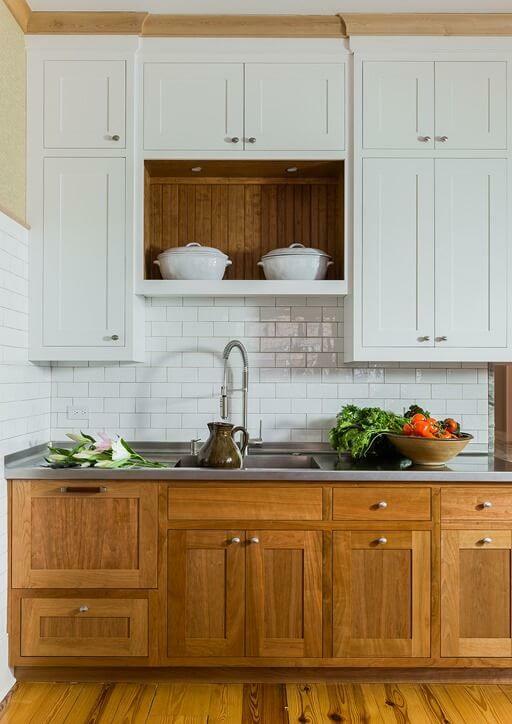 Simple white cabinets and clean silver hardware work well alongside wooden countertops and light colored wall paint. The addition of small open shelves beside the sink is both stylistic and a great choice for providing extra storage space in a small kitchen. Silver accent handles offer a nice contrast on these shaker style cabinets made of rich Mahogany wood. 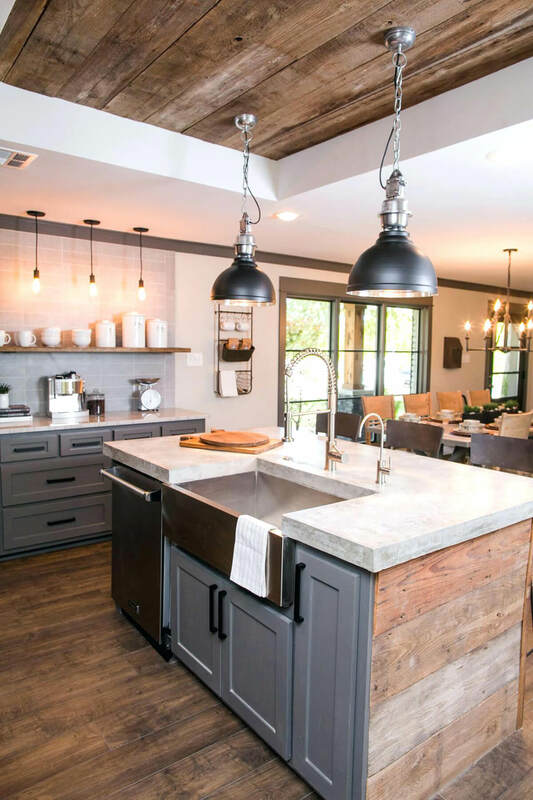 This style provides a rustic feel that nicely compliments the modern steel appliances and granite countertops that surround them. These cabinets allow the perfect contrast to any modern steel appliance that is near them. Cabinetry can be an expensive part of a kitchen, but it doesn’t have to be. 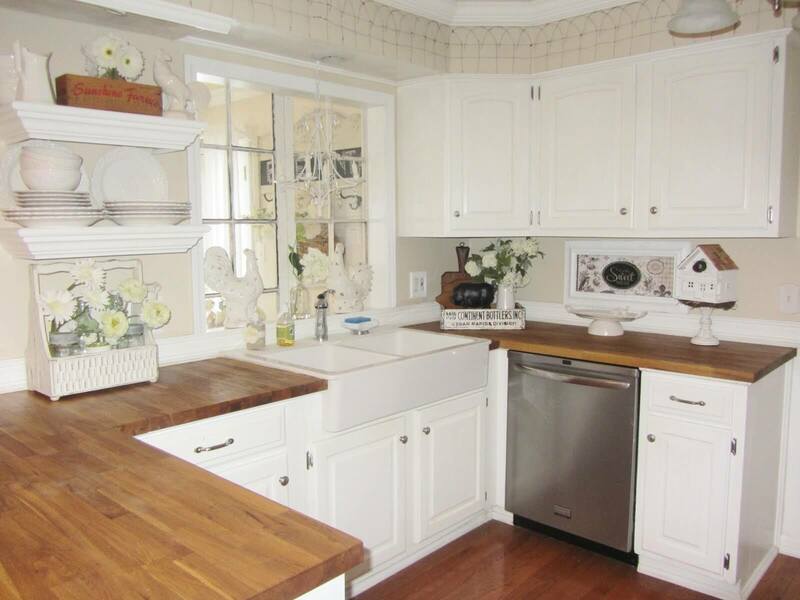 White cabinets allow you to avoid unnecessary stress in the already stressful process of kitchen remodeling. 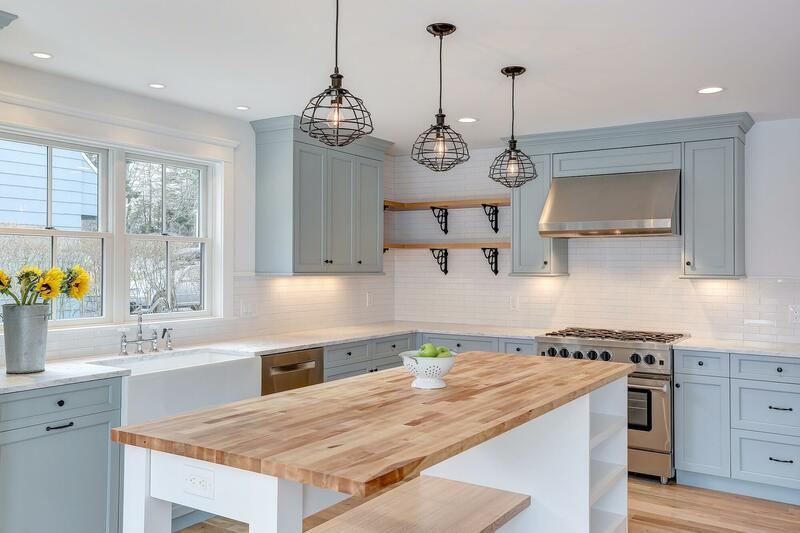 This affordable yet straightforward option enables you to provide a modern look while allowing you a blank canvas should you ever wish to update the color of your kitchen.